Summary and Definition: The semi-nomadic Yakama tribe were fishers, hunter-gatherers and traders of the Plateau cultural group who joined extensive inter-tribal commerce with the tribes of the plateau. The Yakama lands extended in all directions along the Cascade Mountain Range to the Columbia River in Washington. Chief Kamiakin led his people in the Yakima War (1855-1858). What language did the Yakama tribe speak? The Yakama tribe spoke in a Sahaptian dialect of the Penutian language and called themselves Pakintlema meaning "people of the gap," or Waptailmim meaning "people-of-the-narrows," reflecting the location of their villages near Union Gap on the Yakima River. After the introduction of the horse the Yakama people hunted buffalo on the Great Plains and adopted the some of the lifestyle elements of this cultural group. The Confederated Tribes and Bands of the Yakama Nation, or simply the Yakama Nation (formerly Yakima), was a consolidation of 14 bands, or tribes. Where did the Yakama tribe live? The Yakama are people of the Plateau Native American cultural group in the modern day state of Washington. The geography of the region in which they lived dictated the lifestyle and culture of the Yakama tribe. What was the lifestyle and culture of the Yakama tribe? The Yakama tribe lived a semi-nomadic lifestyle fishing, hunting, or gathering wild plants for food. The Yakama tribe lived in pit houses in the winter and and tule-mat lodges or tepees in the summer. The Lewis and Clark expedition encountered the Yakama tribe during their explorations in 1806. The Yakama adopted many of the ideas of the Great Plains Indians including the use of the tepee which were covered with buffalo hides and some items of clothing also made from buffalo hides. Lewis and Clark encountered the Yakama tribe in October 1805 and met Chief Kamiakin, the war leader of the Yakama Nation. What did the Yakama tribe live in? The Yakama were semi-nomadic and needed shelters that were easy to set up and take down. They lived in one of three shelters, depending on the season. The types of shelters were a semi-subterranean pit house, a tepee or a tule-mat lodge. The summer shelters were the tepee and tule-mat lodge, both above ground. Tepees were covered with animal skins but the tule-mat lodge was covered with mats of strong, durable, tule reeds (bulrushes). What transportation did the Yakama use? The Yakama tribe used canoes made of strong and water-resistant birch bark that could be easily bent, cut and sewn. The birch bark canoes were important for the Yakama way of life. The Yakama hollowed logs with fire and then bark was stretched over a strong, but lightweight, wooden frame to make a bark canoe that could be easily steered. The bark canoe was perfect for travel along fast streams and shallow waters and were sturdy enough for the rough waters of the bays near the Columbia River plateau. What food did the Yakama tribe eat? The food of the Yakama tribe included salmon and trout and a variety of meats from the animals and birds they hunted. They supplemented their protein diet with seeds, roots, nuts and fruits. What clothes did the Yakama wear? The clothes worn by the Yakama men and women of the tribe were similar to the clothing of the Nez Perce - please refer to this article for details. What weapons did the Yakama use? The weapons used were spears, lances, clubs, knives and bows and arrows. The Yakama also used shields for defensive purposes. Who were the allies and enemies of the Yakama tribe? The allies of the Yakama tribe were many of the other Native American Indians who inhabited the Plateau region including the Cayuse, Walla Walla, Spokane, Coeur D'Alene, Payuse and the Nez Perce. The main enemies of the Yakama tribe were the Great Basin groups to the south, including the Shoshone, Northern Paiute, and the Bannock tribes. Tensions amongst the Native Indians throughout the Plateau region were increasing due to the white encroachment of tribal lands. In 1847 The tribe fought with their Native Indian allies in the Cayuse War (1847-1855). In 1855 Isaac Stevens (March 25, 1818 � September 1, 1862), the governor of Washington Territory, negotiated a treaty with the Yakama. The Yakima treaty was signed on 9 July 1855 and ceded more than 10 million acres to the United States government in exchange for over 1 million acres of reservation lands in which no white settlers could travel or settle without Yakama approval. Governor Stevens opened Native Indian lands for white settlers less than two weeks after the treaty was signed. A Yakama chief, Kamiakin, called upon the tribes to oppose the declaration and the Yakima War (1855-1858) erupted. It was fought by members of the Native Indian alliance including the Yakama, Cayuse, Walla Walla, Umatilla, and Nez Perce tribes. Their leaders were Chief Kamiakin, Chief Leschi and Chief Kanaskat. The Battle of Toppenish Creek in Yakima Valley was fought on October 5, 1855 and was a major victory for Chief Kamiakin. The Battle at Union Gap was the second engagement of the Yakima War and fought on November 9 and 10, 1855. 700 American soldiers, under the command of Major Gabriel J. Rains, discovered Chief Kamiakin's village of about 300 warriors and the Yakama tribe were forced to retreat with their women and children. In 1857 the Fraser Canyon gold Rush began after gold was discovered on the Thompson River in British Columbia at its confluence with the Nicoamen River. White prospectors rushed to the area and in 1858 the Yakima War escalated to the other Native Indian tribes. The U.S. Army drove them further east of the Cascades and across the Snake River. The Battle of Four Lakes on September 1, 1858 saw the end of the Yakima War. The losses were so great that the Native Indians were forced to sue for peace and settle onto reservations. Some members of the Yakama tribe then participated in the short lived and ill-fated Coeur d'Alene War. Colonel Wright ordered the destruction of 700 Palouse horses at "Horse Slaughter Camp," hanged Yakama Chief Qualchan, and several Palouse Native Indians. This action finally concluded the Coeur d'Alene and Yakima Wars. Who were the famous chiefs of the Yakama tribe? The most famous leaders and chiefs of the Yakama tribe included Chief Kamiakin, Chief Qualchan and Chief Leschi of the Nisqually Native American tribe. What happened to the Yakama tribe? The following Yakama history timeline details facts, dates and famous landmarks and battles fought by the Yakama Nation. The Yakama history timeline explains what happened to the people of their tribe. 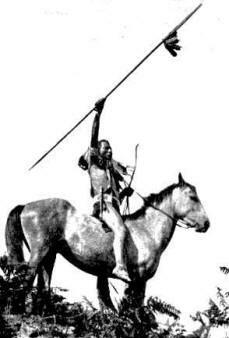 1750's: The Yakama acquire the horse and their lifestyle changed as they were able to travel to the Great Plains to hunt buffalo. 1840's: Lieutenant Charles Wilkes, was sent by U.S. government to explore the Pacific Coast. 1855: Isaac Stevens (March 25, 1818 � September 1, 1862) , governor of Washington Territory, negotiated a treaty with the Yakama. 1855: Governor Stevens opened Native Indian lands for white settlers less than two weeks after the treaty was signed. Yakama chief, Chief Kamiakin, called upon the tribes to oppose the declaration. 1855: The Battle at Union Gap was fought on November 9 and 10, 1855. 1858: The events at "Horse Slaughter Camp" concluded the Coeur d'Alene and Yakima Wars. 1933: The Yakama tribe was organized as the Confederated Tribes of the Yakama Nation. 1994: the Yakima Nation adopted the spelling of its name as "Yakama," which they feel is the more correct historical spelling of their name.